It’s been written in many different forms by various philosophers and authors throughout history: Our thoughts and the words we speak create our lives. Do you pay attention to how you and those around you speak and regularly interpret events? We all know Debbie Downers who seem to find a negative spin on almost any situation as well as a few Pollyannas who always see the silver lining. I know I can be the worst offender. I often think if only I had just moved to Costa Rica to surf instead of gone to Pepperdine, then I wouldn’t have all of these ridiculous student loans. Then I have to remind myself that it’s over and done with (at which point I immediately start singing the Proclaimers song Over and Done With aloud). The example he uses is how he previously saw the world as a place of scarcity coming from a background where both love and money were scarce. Hendricks made the conscious choice to no longer speak of scarcity. So from this day forward I vow not to speak of my limitations. I vow to speak only of possibility. I will not engage in conversations about victimhood. Thanks for the comment! 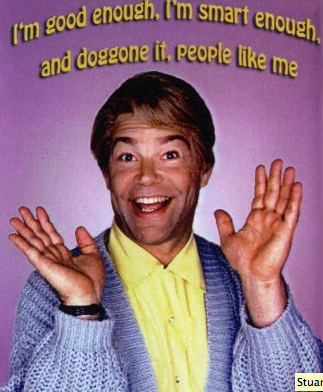 I’ve been watching a few Stuart Smalley clips on YouTube recently. Classic!